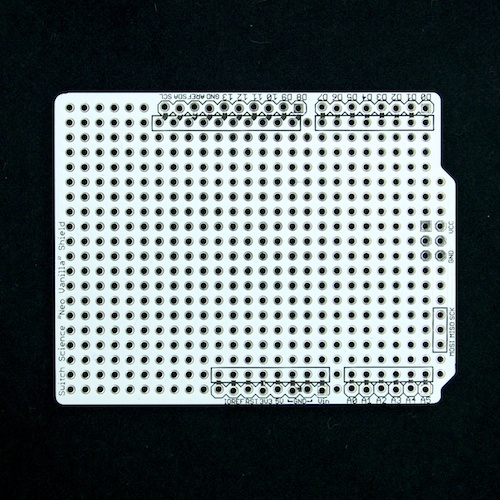 "Vanilla Shield" is a very simple universal board suitable for Arduino. In the Arduino community, this type of board is equivalent to what is called the proto shield. We believe that this Vanilla Shield has a larger universal area than any other proto-shield. There are no predefined locations for resistors, capacitors, LEDs and ICs. Vanilla Shield allows you to try anything you can think of. The name Vanilla Shield is taken from the idea of vanilla ice cream, which is a standard of all flavors. If you are an experienced software engineer, you should know why it is "vanilla". You have to prepare pin headers or pin sockets, and you have to solder them yourself. 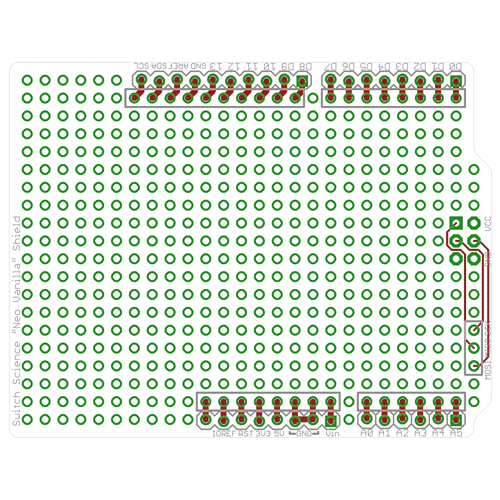 The pad patterns for pin sockets are aligned in zigzags, which can make soldering easier. This idea comes from SparkFun's "Sneaky Footprints". Note: This product does not include any pin headers. Note: You can communicate using SPI signals via the Arudino ICSP header. Please see the picture bellow.